Tired of spending hours each day looking for an aviation job? Is your aviation career or aviation job search at a stand still? Let us help! Jobseeker registration is FREE. Click here to register and start receiving aviation job notifications today! Join thousands of aviation professionals who receive our daily aviation job postings without any cost or obligation. By registering with us, you will become part of one of the largest online aviation job databases on the World Wide Web and find the aviation job you are seeking. We have thousands of registered Domestic North American employers listing their aviation jobs and open positions with us. 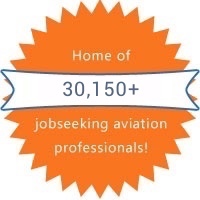 If you are serious about finding employment, FlightLevelJobs.com is a single source of aviation employment information with many exciting and hard to find aviation jobs posted every day. We are an online aviation job search service specializing exclusively in aviation jobs and aerospace jobs and employment opportunities. If you are a pilot, we have one of the largest pilot jobs listing databases on the world wide web. Pilot employment just got easier with our guaranteed jobseeker interviews program. Looking for an Aviation Job? Sign up today for full access to the best Aviation Jobs! We at FlightLevelJobs.com have become one of the best-known and most popular niche sites for aviation/aerospace opportunities. We welcome your comments about our site. Send comments to admin@flightleveljobs.com. Thank you for visiting and we look forward to providing you with the best service and results you expect. We strive to be the leader in aviation jobs on the web! Please cancel my membership. I have found new employment thanks to your site! Your site is one of the few sites that has Flight Attendant job listings! I just landed a wonderful corporate (Part 91) position shortly after becoming a member. Will recommend your firm to all my Flight Attendant friends. I joined your site because you guys live up to your word. I am not interested in finding employment overseas. Virtually all of your listings are for positions in the USA or Canada. Best $59.99 I have ever spent. I obtained a job within two weeks of becoming a member. Just a quick note to let you know that we have found your company to be an invaluable resource to our flight department. Through the years we have tried posting our pilot job openings with many firms but have the greatest number of responses when we list them with your firm. Please keep up the great work. I have been unemployed for over 14 months and tried just about all of the other online aviation job search sites with no success. Within two months of becoming a member at FlightLeveljobs.com I found my �dream� job. Please cancel my subscription at the expiry of what I have paid for. Thank you for your services, I will no longer be seeking employment as I have found employment through the use of your company. Please cancel my subscription to Flight Level Jobs. I have successfully found employment with a cargo operator! Thanks! Thanks to you, I landed the job. *See Terms of Service Agreement for full details. Interested in a link exhange?